Wow how is she able to do that? Balancing on what it looks like a branch of a tree. I actually remember this scene from the visual novel! 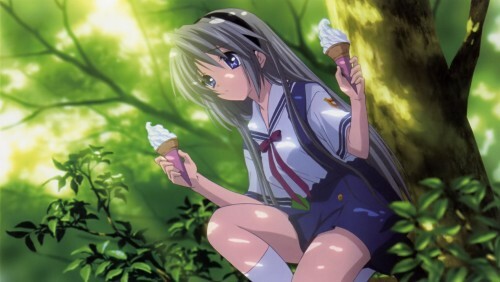 To cornelia4: She's there waiting for Tomoya so that they can eat the ice cream together, but has to wait up on a tree because there's someone nearby that she wants to avoid. To rogue-star: Tomoya, after spotting her balancing on the tree while caring an ice cream cone in each hand, also was surprised that she was able to do that, in the visual novel. is another one for me ? Great pic but lets think about how she got up there. No hands, can't climb... So she must of jumped 8ft-10ft to get up there. Go Tomoyo. Otra vez, lo rescatable de esta imagen es el fondo, me encanta como dibujan los arboles. para quien sera el otro helado? Thank You For Sharing!I like it very much! i love this pic. thanks for sharing.